Review: I caught the C R E A T I V E B U G ! Spoiler: After reviewing Creativebug, I subscribed myself and also joined the Affiliate programme. This post includes affiliate links (read more here) but as always, the opinions are entirely my own. There are various 'yarn' craft projects (knitting, crochet, macramé) but unlimited access to everything else has definitely encouraged me to look at the crafts I don't know so well. I've been watching jewellery making, sewing and papercrafts and there are lots of things I plan to try once I get a few supplies. There are 10 minute tutorials, five hour art classes presented in chapters, and everything in between. As the content is mainly project-focussed, there are plenty of entry-level classes and 'workalongs' where every step is covered in detail. There is a good selection of knitting projects (plus others for sewing, embroidery, quilting, crochet, jewellery and art) which can be worked 'with' the instructor. I watched Edie Eckman's faux cable sock class, and it is great - suitable for a knitter wanting to try a first pair of socks, or anyone who has made toe-up socks and would like to try a different construction (top-down). The PDF pattern is included and Edie walks through every step necessary to complete the socks. I've already made several pairs of socks but still picked up a few tips, including a great stitch marker tip that I will definitely be using! The instructor line-up includes many names you will recognise, such as Kaffe Fasset, Wendy Bernard, Gudrun Johnson, Amy Butler, Debbie Stoller and too many others to mention. 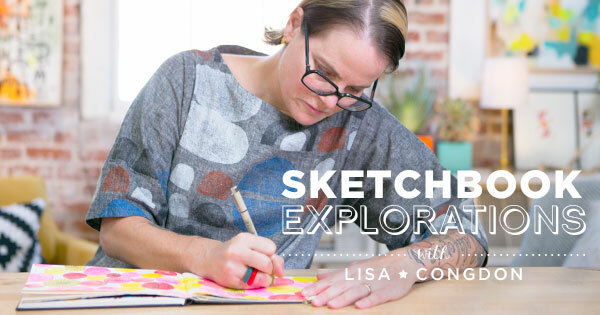 I've been dipping in and out of the different classes but have mainly been working along with basic line drawing and sketchbook explorations, both taught by Lisa Congdon (I love her work and her blog). 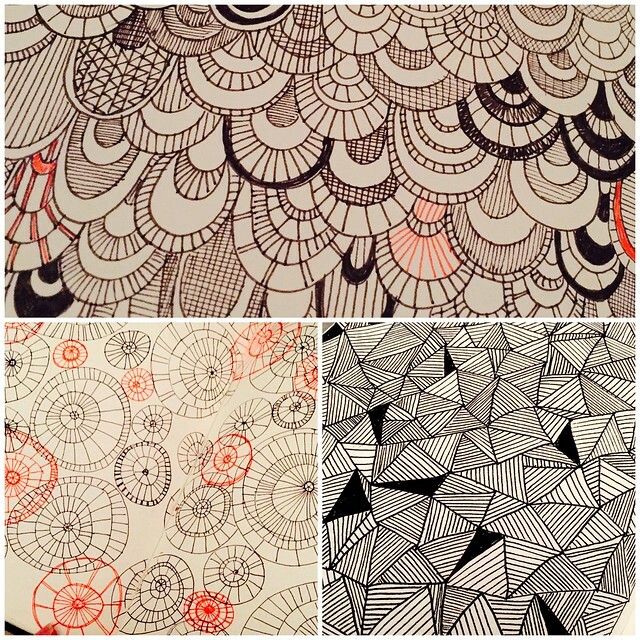 You can see some examples of the geometric shapes in my sketchbook as a result - it's so much fun! Classes can be accessed online and also via the Creativebug app for mobile devices and it is possible to download content to your device to watch when you can't access the internet. 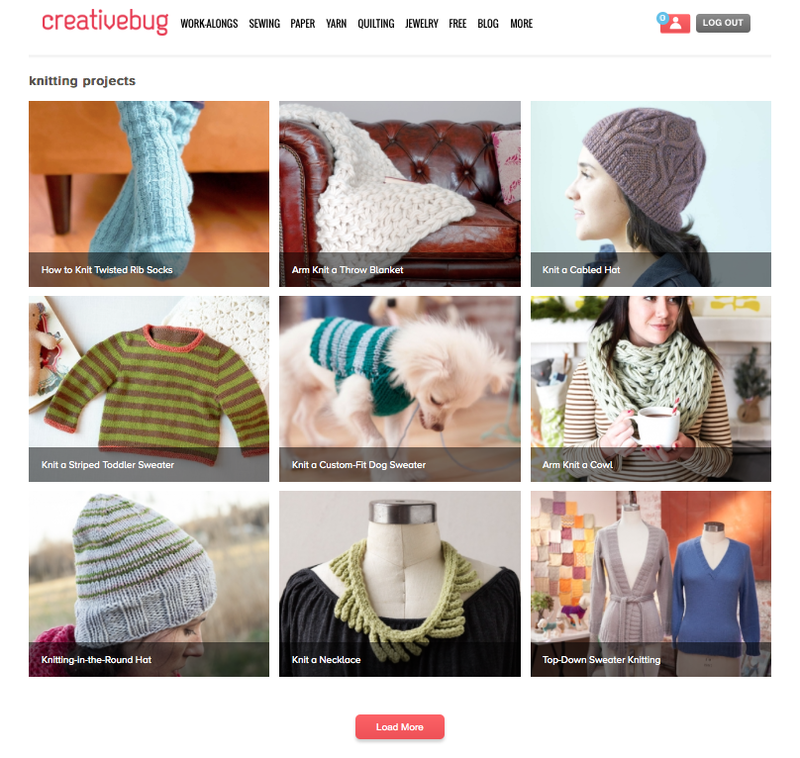 There is also a 'community' aspect - you can upload pictures of your projects and see what others are making. There isn't interaction with the instructor as per the Craftsy platform, but these classes are more economical and less technical, so that's not really surprising. The main thing missing from Creativebug is the option for closed captions. My mum is quite frustrated that I'm raving about something she isn't able to watch as she can't hear it. I hope that will change in the future. As well as complete projects, there are various techniques and also some free content which you can try out. New classes are added each month too. For $4.99 I think a subscription represents superb value for money (unless you're deaf). You can start a free 14-day trial here - as with most trials, you need to add payment details but won't be charged until the end of the trial and you can cancel at any time. For each month you pay the subscription, you can choose one class to keep forever, which is also great value. Yes, I've definitely caught the creative bug and I'm sure you'll be seeing more things inspired by these classes - if you've used Creativebug, let me know your favourites so I can check them out!